You can create a meeting in MeetingKing using Outlook, Google Calendar or iCal. Just create a new meeting request in your preferred calendar application, add schedule@meetingking.com to the list of invitees and send the meeting request. MeetingKing will create a new meeting space for you and add all invitees, the date, time and location. Within a minute the meeting will appear in the overview of all participants and the organizer will receive an email with a link to that meeting space. If you already have a meeting scheduled in your calendar, simply add schedule@meetingking.com to the list of invitees and send the update, MeetingKing will do the rest. 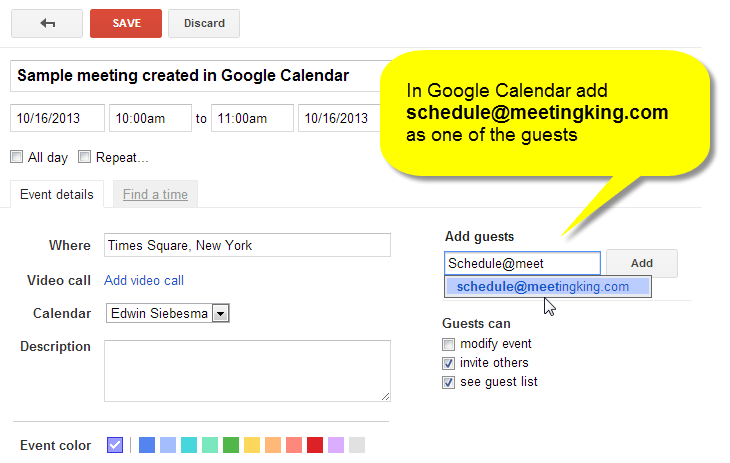 If you use Google Calendar please make sure you look at Adding Google Calendar to MeetingKing. Complete a meeting request as you always do, just add schedule@meetingking.com to the list of invitees and send the meeting request. !You do need to send/email the meeting request so MeetingKing receives it. MeetingKing is not directly connected with Google Calendar, Outlook or iCal, it copies the information from the meeting request you send. In about a minute the meeting will show up in the dashboard of all invitees. When you open the meeting you will see that all information is automatically copied.